When introduced last year, the original Nightforce 15-55x52mm Comp Scope sold for $2231.00 (or more). Now that same 2013 edition Nightforce Comp Scope can be yours for just $1850.00. This is a special promotion for AccurateShooter.com readers and Forum members. 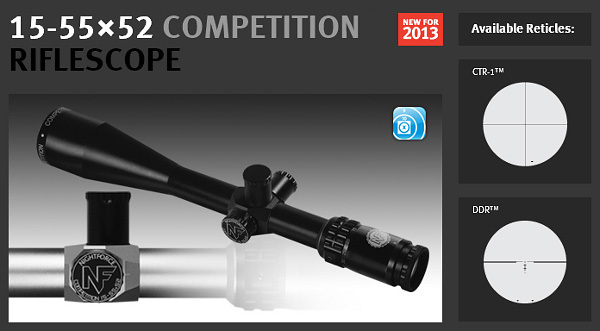 The 2013 Edition Comp Scopes are on sale because the Gen One model has been replaced by a second-generation model. IMPORTANT: To get the super-low $1850.00 price you must call or email EuroOptic and mention that you saw this offer on Accurateshooter.com. Otherwise the price on EuroOptic’s website is $1950.00. To get the $1850.00 price call (570) 368-3920 or email sales [at] eurooptic.com and request the AccurateShooter.com Nightforce 2013 Competition Scope Special. The 2014 version of the Nightforce 15-55 Comp Scope will cost at least $2352.00 (MAP) and it will not arrive at dealers for many more weeks (or months). If you buy the 2013 Edition NF Comp Scope you can save $502.00 compared to the 2014 model, and you can get your scope right now. Saving over $500.00 provides a pretty compelling reason to go with a Gen One 2013 model. NOTE: This is a LIMITED-QUANTITY Offer. When these scopes are gone they’re gone (2013 model NF 15-55x52mm Comp Scope has been discontinued). What’s the Difference Between 2013 Comp Scope and 2014 Model? The 2014 edition has turrets with 10 MOA per revolution instead of 5 MOA per revolution. The 2014 model also has a zero-stop feature and more reticle choices. Other than that, the previous 2013 Edition is pretty much the same as the later version. Both have 15-55X magnification, boht have 0.125 MOA click values, both have 52mm front objectives, and both have 80-90mm eye relief. 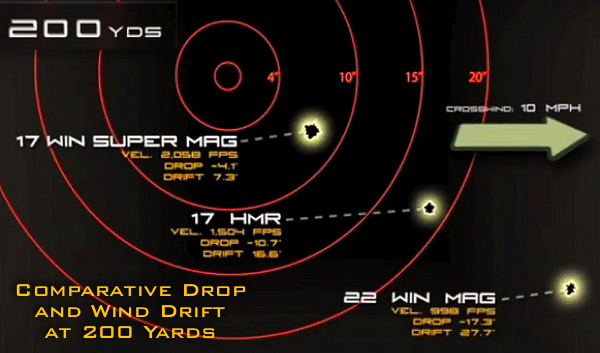 The 2013 does have some advantages — it offers 60 MOA of elevation and 60 MOA of windage travel. The 2014 version only has 55 MOA of elevation and 50 MOA of windage. Also, the SILVER COLOR is only offered in the 2013 Edition. The 2014 model comes only in Black. Share the post "Gen 1 Nightforce 15-55X Comp Scope $1850.00 at EuroOptic.com"
It’s been a long time coming, but we are finally starting to see supplies of Winchester’s 17 Winchester SuperMag (17 WSM) rimfire ammunition, along with factory rifles chambered for the fast little 17 WSM cartridge (it runs up to 3000 fps). Leading the way among new 17 WSM firearms is a hot little rifle from Volquartsen Custom. This new Volquartsen semi-auto 17 WSM will be unveiled at SHOT Show next week in Las Vegas. 17 WSM semi-auto prototypes have been built and tested. 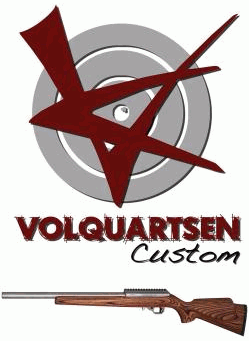 Volquartsen will begin taking orders at the 2014 SHOT Show. The initial release will feature a laminated wood stock, stainless steel receiver and a stainless steel bull barrel. Standard magazine capacity will be 8 rounds. The rifle will utilize a direct blowback action. We are pursuing additional stock options as well as options for a lightweight version of the rifle, however there is no anticipated release date for either. The 17 WSM cartridge necessitates a different action than our 17 HMR rifles. Unfortunately, 17 HMR rifles cannot be converted to 17 WSM. 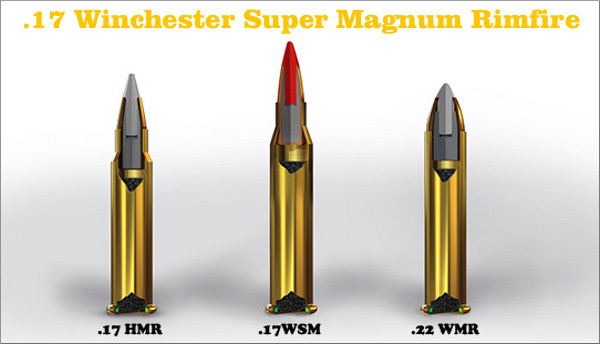 Winchester has created a new, high-velocity 17-caliber rimfire cartridge, the .17 Winchester Super Magnum (aka .17 WSM). 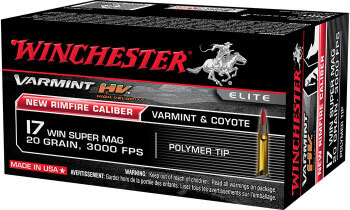 Winchester offers .17 WSM ammo with a choice of three bullet types: 20gr plastic tip (Varmint HV), 25gr plastic tip (Varmint HE), and a 20gr JHP (Super-X). The 20-grain varieties boast a 3000 FPS muzzle velocity, earning honors as the fastest Rimfire ammo ever made. Winchester claims that all .17 WSM ammo types shoot much flatter than the .22 Win Mag and .17 HMR, while delivering 150 percent more energy than both. In addition, the .17 WSM “bucks the wind” better than any other rimfire ammo — exhibiting significant less horizontal drift at extended ranges. Share the post "Volquartsen Semi-Auto 17 WSM Debuts at 2014 SHOT Show"
If you live in New York state, in one week you will no longer be able to purchase ammunition from an online vendor and have that shipped directly to your home or business. Effective January 15, 2014, New York’s SAFE Act mandates that all ammo sales be conducted through a face-to-face transaction with a registered New York “brick and mortar” ammunition dealer. Retailers are alerting New York-based customers that the final day to order ammo online will be January 14, 2014. The SAFE Act requires that, starting January 15th, all New York ammunition purchases be made face-to-face, with buyers subject to background checks. At this point, no online retailer has announced a procedure that will allow online ammo sales to continue for New Yorkers. Online sales are not outlawed per se, but the ammo would somehow have to be shipped to a New York-based ammunition dealer who would then conduct the requisite background checks. In a communication with WGRZ-TV, NY State Police spokesperson Darcy Wells declared that two requirements will go into effect on January 15, 2014. “The first is the law that requires all sellers of ammunition to register with state police and the second law that requires all ammunition transfers to take place face-to-face and be facilitated by a New York State ammunition dealer. These provisions will go into effect on [January 15, 2014],” Wells explained. “The SAFE Act law also provides that background check and record keeping requirements imposed on all retail sellers of ammunition are scheduled to take effect 30 days after the Superintendent of the New York State Police certifies that a statewide license and record database is created for such a process. That certification has not yet been made and the system is still being developed.” Read Related Story. While several groups have filed lawsuits challenging various provisions of the SAFE Act, as of this writing, no legal ruling will forestall or block the ammunition sales restrictions from taking effect on January 15th. The New York State Rifle and Pistol Association (NYSRPA) is trying to restore New Yorkers’ rights to purchase ammunition from online vendors. To support that effort, AmmoMan.com is donating 2% of all New York orders to the NYSRPA to help fund legal expenses. Share the post "Notice to New Yorkers: SAFE Act Blocks Mail-Order Ammo Sales"